Ark Royal is a classic rise of the down trodden to fame. Based around the exploits of an old starship, kept from the scrapyard due to its previous claims to victory, it focuses on how the old design benefits the human race as it encounters a new and yet to be understood alien race. As well as the ship itself being out of date, it is crewed by a group of individuals who all have their problems and difficulties, both personally and professionally. 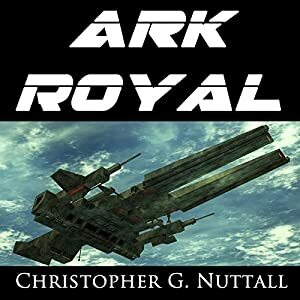 The story centres around the journey and encounters of the Ark Royal with the invading alien race and the development and interaction of the ‘rag tagged’ crew. Performance – the narration is very good, with the voices being used being believable and suitably different so you know which character is talking. The narrator creates suitable atmospheres throughout the book and engages the reader with both the story and the characters. Favourite Character – There are definitely many to choose from including the dedicated PA to the captain, to the almost reluctant leader of the fighter squadron. The struggle between the captain and the second in command is interesting from the start, it how this develops adds to both the storyline and the plot. Even the head of engineering is an engaging character. Tag Line – Not being the most creative person, this causes me some problems although the best I can come up with is – “Maybe you can teach old dogs new tricks”. Recommend this book? If you enjoy the sci-fi genre beyond the perfect world of Star Trek and Star Wars, then this is definitely a book you should read. The story line is engaging and there is not a huge amount of hard to follow space mechanics described. You get the feeling that you are in space without the need to understand astral physics. The characters are easy to relate to and their interactions are based on real world examples, making the whole situation believable. If you are looking for a sci-fi book which is firmly rooted in human interactions and ‘reality’ then this is a good choice. If you hate space and starships – then maybe avoid this one.